← America First, Trade Last? — 13 Obvious Observations. Ominous Signs — For China and Even More So for the WTO? No new final trade actions by the Trump administration, but several ominous signs — for both China and the WTO as well as the trading system. The U.S. International Trade Commission is recommending escape clause action under Section 201 (tariff-rate quotas) concerning Samsung’s washing machines being imported from Korea into the United States and action concerning solar panels from China. Bills are moving along in Congress concerning CFIUS which are in fact aimed at confronting Chinese investment into U.S. technology and communications firms. The USTR is continuing its Section 301 investigation (unilateral retaliation) as to China’s intellectual property practices. 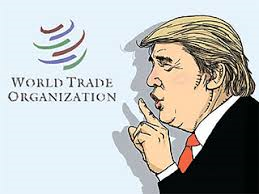 The aluminum case pending in the WTO was originally filed by the Obama administration is heating up. Parties are arguing over the “market-economy status” of China. The national security Section 232(b) case concerning steel imports is also pending. So the question is now this — Do these actions indicate a willingness by Trump and Lighthizer to confront China more forcefully? Or do they go a gigantic step further to contest the legitimacy of the dispute resolution system of the WTO and, in fact, the entire WTO along with the entire international economic order of the post-war world? ….. “Trump to Decide on Tariffs for Imported Washing Machines.” New York Times (Nov. 22, 2017). ….. “U.S. Toughens on China Trade.” Wall Street Journal (Nov, 22, 2017).